Three of the most promising fighters from the famed ALA Gym are ready to face up to the tough challengers they will meet in “Duel in Dubai” at the classy International Trade Center in Dubai on September 5. The fights will be telecast by the giant broadcast network ABS-CBN Channel 2 on September 6 at 10:15 p.m.
“Duel in Dubai” is being organized by ALA Promotions in cooperation with the ABS-CBN global network TFC – The Filipino Channel – which has a strong presence in the middle east. 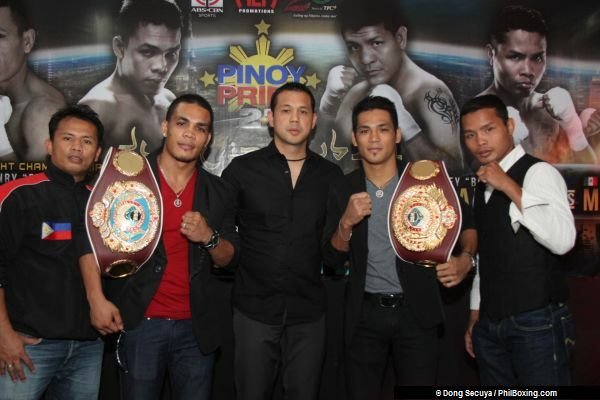 TFC executives reported on Saturday that tickets for the “PINOY PRIDE XXVII” fights have been almost sold out and only a few of the cheaper priced tickets remain. Inspired by the news of the near sell-out one week before the fights, undefeated Genesis Servania and King Arthur Villanueva and charismatic Rey “Boom Boom” Bautista who is very popular in Dubai vowed to pit on a show for what is expected to be a predominantly Filipino crowd. Servania, who has a record of 24-0 will defend his WBO Intercontinental super bantamweight title against rugged Jose “Matador” Cabrera of Mexico who fought for a world title three times against such notable champions as Omar Andres Narvaez, Tomas Rajas and Manuel “Chango” Vargas. Servania told a farewell news conference on Saturday that he has studied tapes of Cabrera’s fights and knows he will be a tough opponent who, like all Mexicans, comes to fight but that he has trained hard for three months and is ready for the challenge. Unbeaten WBO International super flyweight champion Villanueva who is backed up by a record of 25-0 with 14 knockouts expects a fierce battle against Nicaragua’s Henry “El Crespo” Maldonado who is coming off an impressive 5th round knockout of Bayardo Ramos to win the vacant WBO Fedebol title last February 28. Like Servania, Villanueva said he hopes to put on an impressive performance and move one step closer to a world title fight. Bautista who is eager to regain his stature as one of the best fighters in the country on his comeback trail has what many consider the toughest assignment among the three ALA fighters when he battles reigning WBC Mundo Hispano champion Juan Jose “Piquet” Martinez, a go-for-broke Mexican with a record of 16 knockouts in 19 wins with only one defeat. Bautista said this is the kind of opponent he likes, someone who is aggressive and comes forward because he himself likes to trade big shots and entertain the fans.